Chelsea are set to lose one of their prized young talents as Dominic Solanke has set his sights on joining Liverpool in the summer transfer window, according to a report from The Sun. 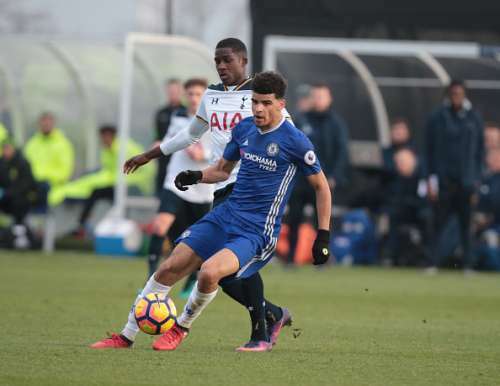 The 19-year-old’s contract at Stamford Bridge will run down at the end of the season and the teenage forward has decided against signing a new deal. He is demanding a weekly wage of £50,000-a-week but the west London club are unwilling to match his demands. As per the report, Solanke has already informed his friends that he will leave Stamford Bridge and make a switch to Anfield. He wants to be part of Jurgen Klopp’s squad in order to establish himself as a player in the Premier League. Former Liverpool manager Brendan Rodgers wanted Solanke to join him at Celtic, however, the attacker has rejected an approach from the Scottish club in favour of a move to Liverpool. The teenager came through the ranks of Chelsea’s youth system and made his first-team debut when he came off the bench to replace Oscar in the Champions League win over NK Maribor in October 2014. That made him the youngest player in the club’s history to make a debut in the competition. Lack of playing time with the Blues saw the striker join Vitesse Arnhem on a season-long loan during the 2015-16 campaign. His impressive form saw him represent England at all youth team levels and was called to train with the senior team by the former Three Lions manager Roy Hodgson when he was in charge of the national team. Solanke was part of England Under-17’s UEFA European Under-17 Championship squad in 2014 where he was the tournament’s joint scorer with four goals and was on target in the semi-final and the final. Chelsea are making no effort to keep him at the club and he has no desire to continue with his current employers after this season. He is keen on completing a move to the Merseyside club, despite the Reds unwilling to match his wage demands of £50,000-a-week. However, an assurance from Jurgen Klopp to be a part of his first-team plans has convinced him to join Liverpool. Though Solanke will be a free agent in the summer, the Reds may have to pay a fee of £8 million to Chelsea as it could go to the tribunal. Daniel Sturridge, who left Chelsea for Liverpool, is unlikely to continue at Anfield beyond this season. Sturridge’s potential departure will clear up space at Liverpool and Solanke is hoping to fill that void. Antonio Conte has Deigo Costa and Michy Batshuayi as the two first choice strikers at Chelsea, and it is unlikely that Solanke will be able to challenge these two players for a place in the Blues’ starting line-up. Solanke could add more firepower to Liverpool’s attack if he decides to seal a switch to Anfield. Solanke’s decision to leave Chelsea as a free agent could turn out to a good decision if he finds a club that will assure him minutes with the first team and also focus on his development. Klopp may be the ideal manager and Liverpool could be the ideal club for him, but a move to Celtic would have been the better option for the teenager as the Scottish Premier League isn’t as tough as the Premier League and he will be assured of a starting place at Celtic.